Twinkle Twinkle Little Star – We’ve practiced this song many times in the past, so R is familiar with this one! She’s now learning to sing some of the words to twinkle twinkle little star. She sings the, “up above the” part and sings it “uppa bubba” :). I love how she knows to change words into “songs” by extending them as she sings. I have no idea why, but R absolutely loves cardboard boxes. 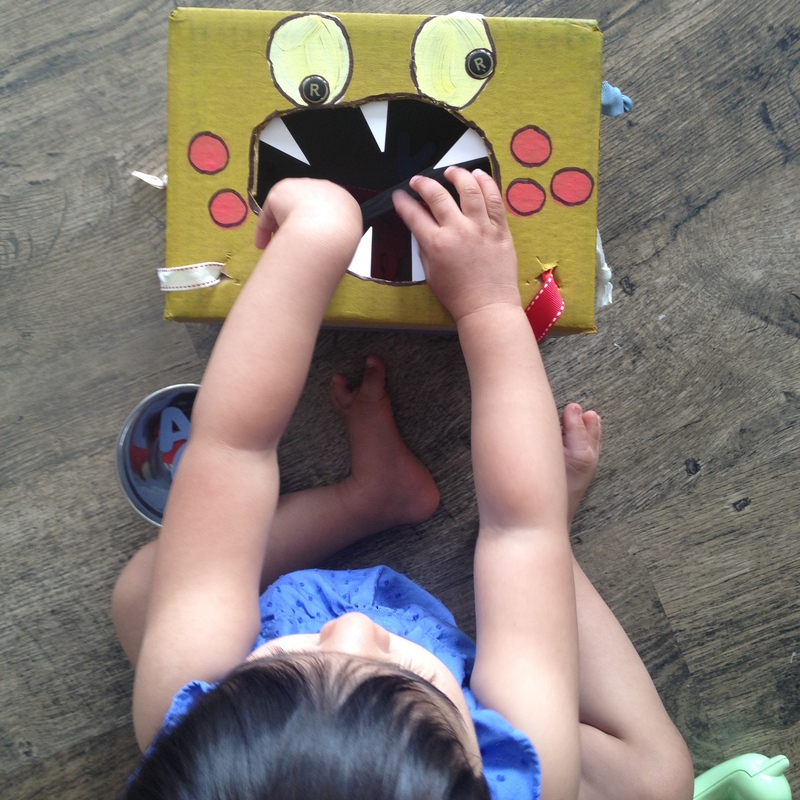 She can spend forever in a box laughing, playing and exploring. 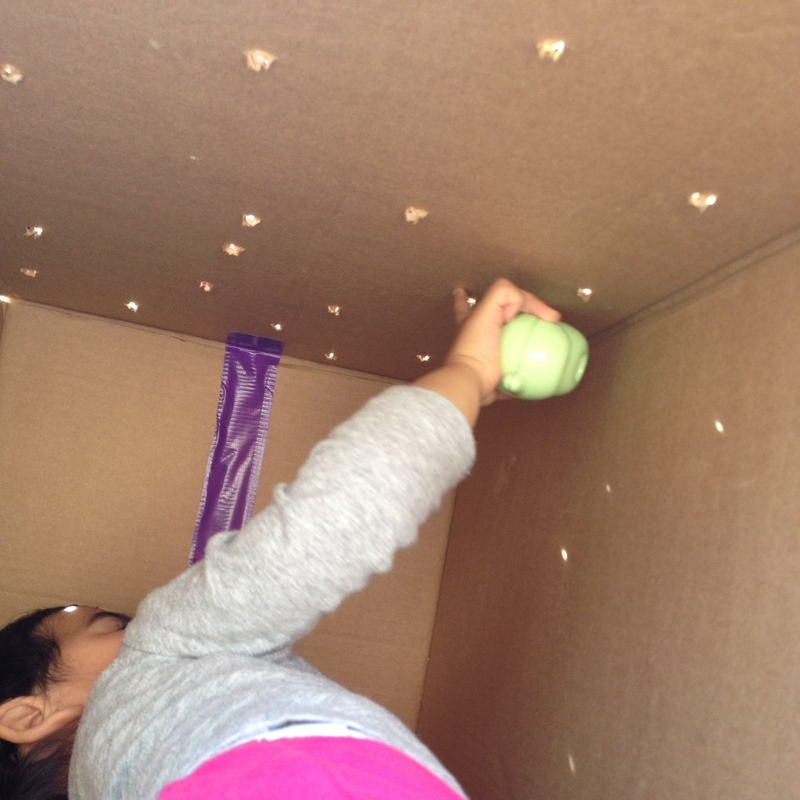 For recreating the experience of camping under the stars, I poked some holes in a cardboard box and we looked at the how the light was shining through the holes. 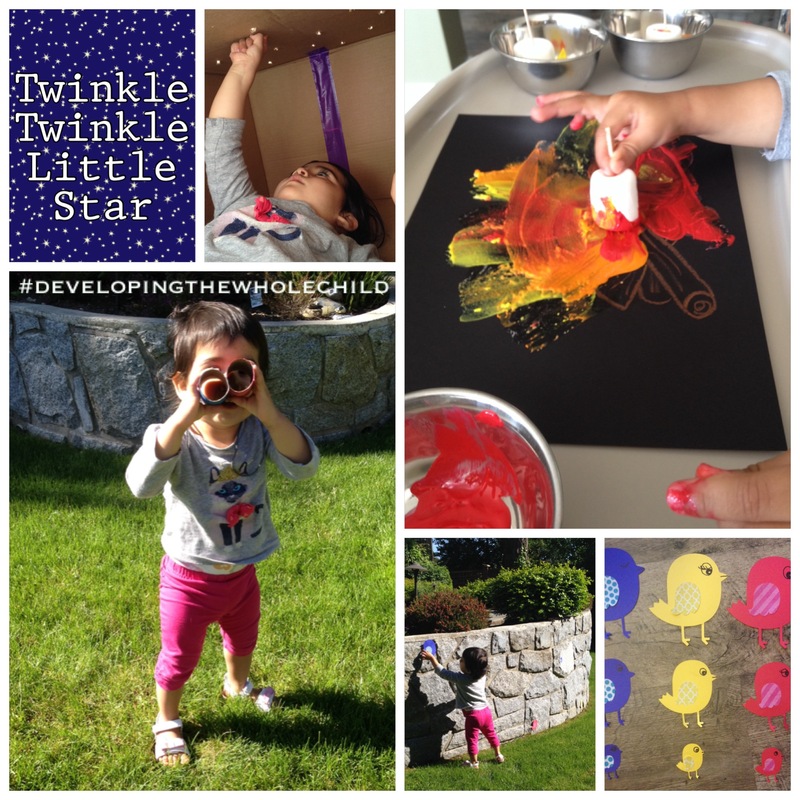 As R poked at the holes in the cardboard box, we sang twinkle twinkle little star together. a. Explore the concept of translucent, transparent and opaque materials with your child. For our last day of our colour study (for now), we mixed red, blue and yellow food colouring into the play dough I had made a few days ago. It has stayed perfectly soft in an air tight Tupperware container. 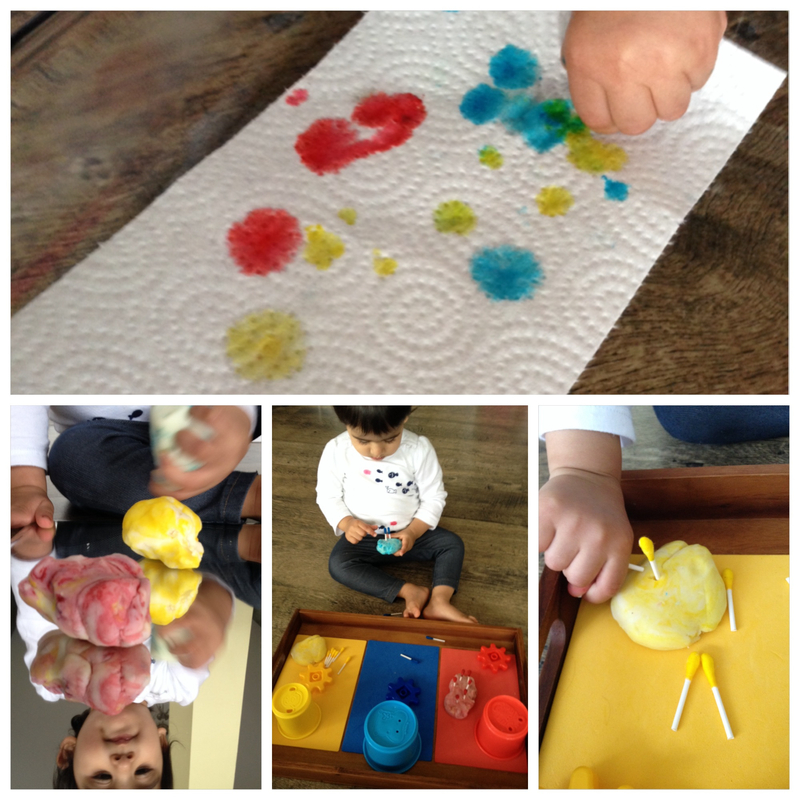 Mixing colours into play dough is a great way to develop fine motor skills and strengthen a child’s grip. The week of cognitive skills development continued with more colour fun. 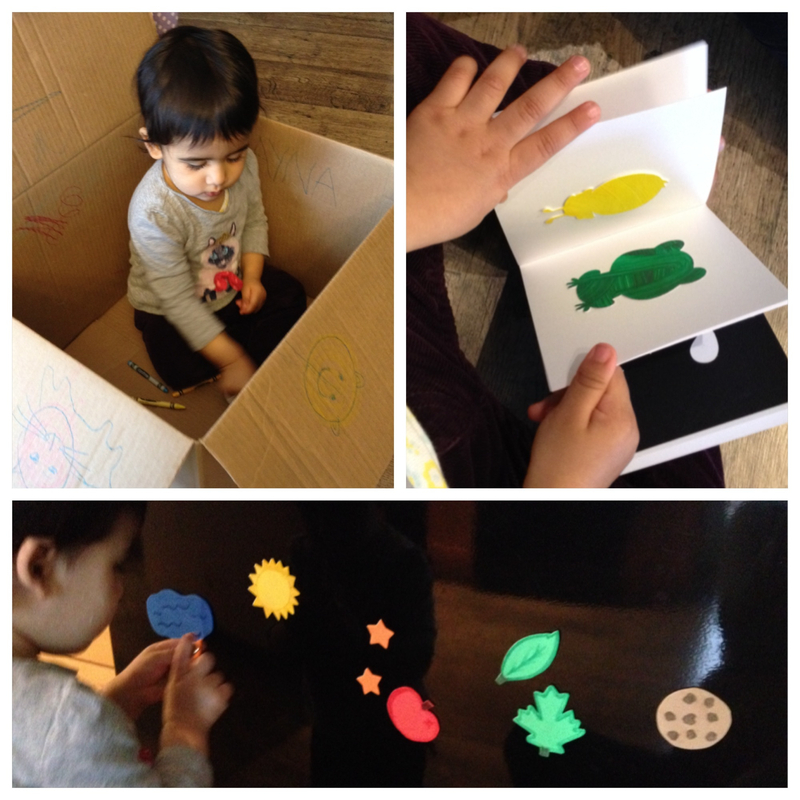 To change things up for a drawing activity, R did some drawing on a box while sitting inside. 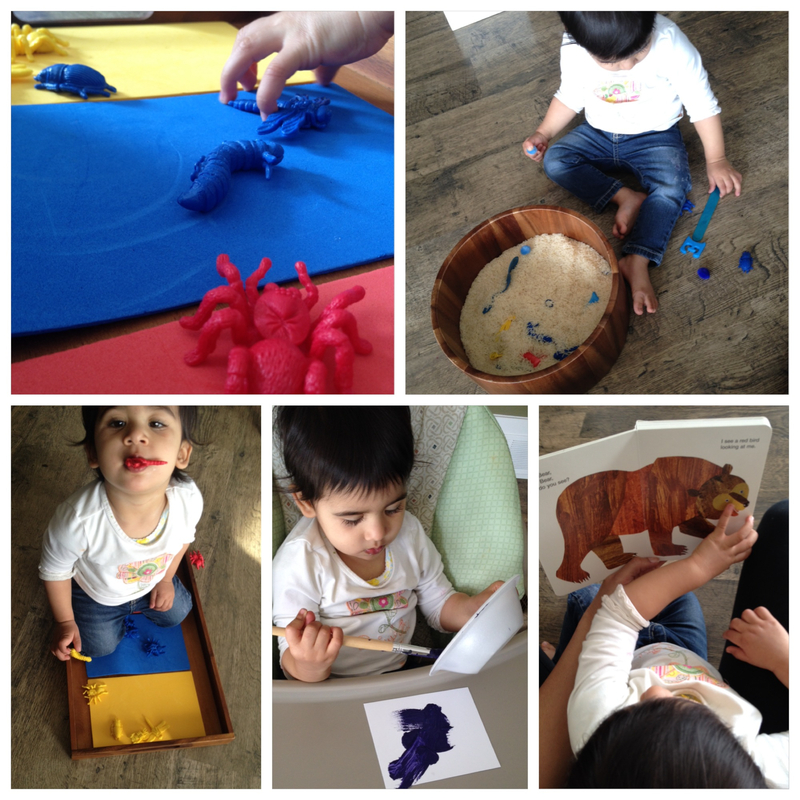 I gave her just red, blue and yellow crayons so that we could continue to learn the primary colours. She had a great time in there! 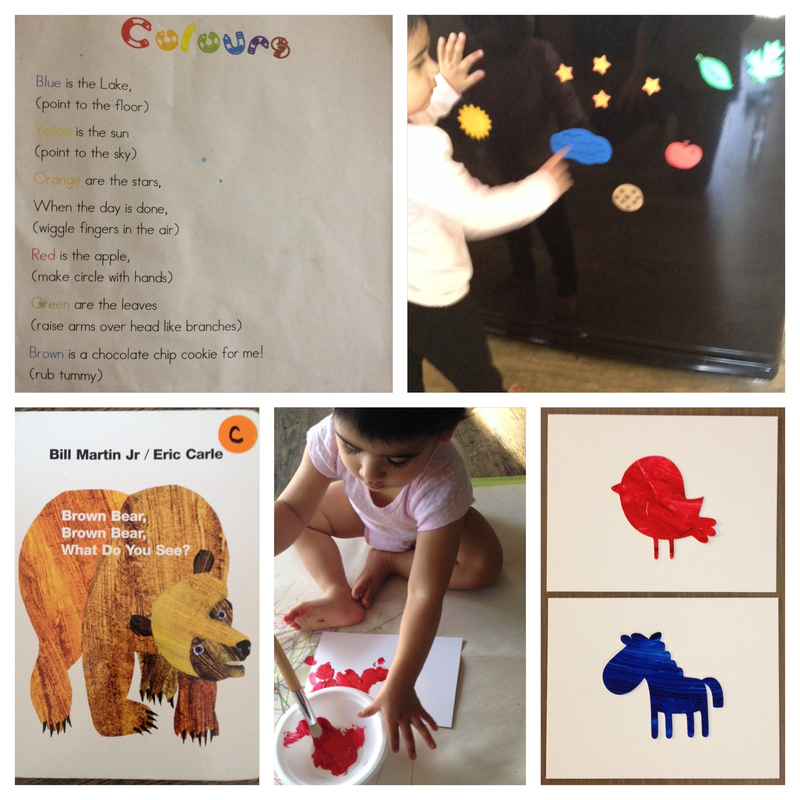 Our colour study continued, well for the most part… We read Brown Bear again and R was still fully enthralled. She finished the last of the painting for our homemade colour book. We continued with our colour study, today. Most of the activities were a repeat since R learns best with multiple repeated exposures. Painting: we worked on three new pages for our homemade colour book. 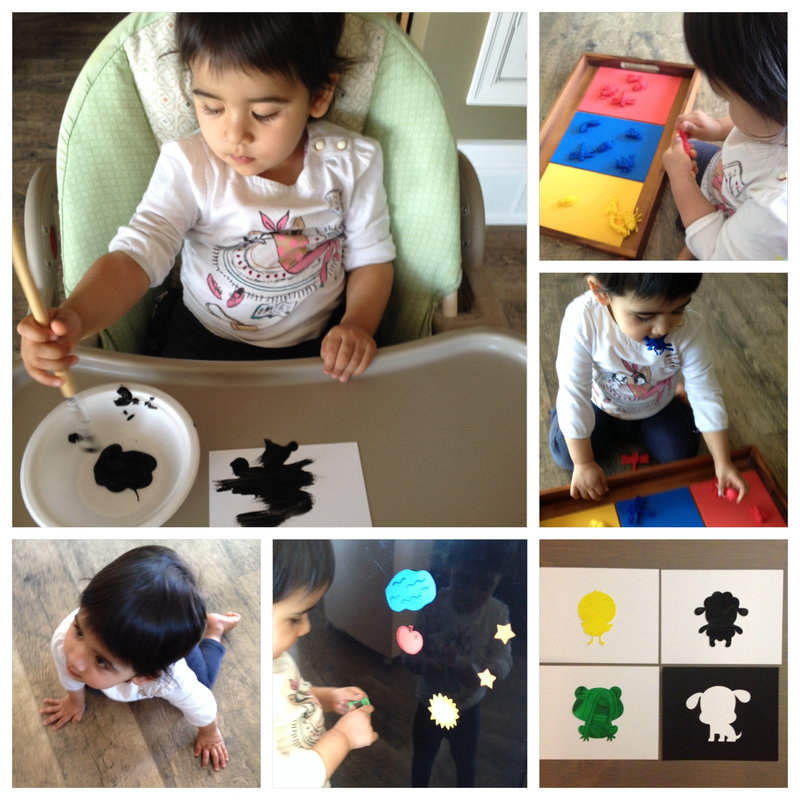 I found that R was able to focus much better at painting while she was in her high chair. It also made clean-up and containing of the mess much much easier! We read, “Brown Bear, Brown Bear”. R loved the book and had me and her aunt read it to her a number of times. 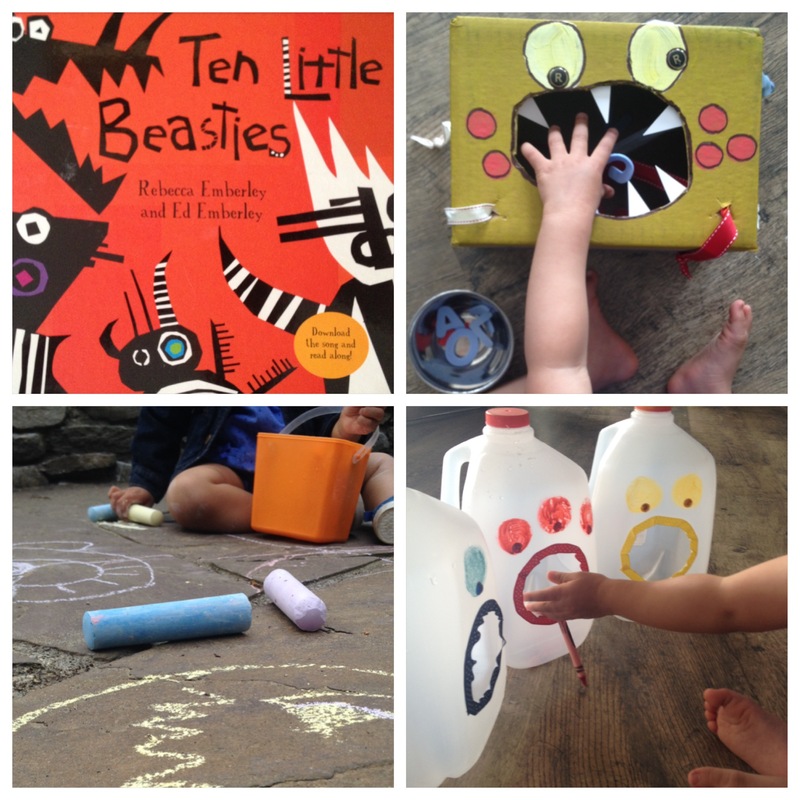 I thought it would be fun to make our own version of the book, so I had R do some painting. I got her to paint a solid colour on one page, and once it dried, I cut shapes out of it using my Cricut machine. I hope to use our homemade book with R as she begins to say colour words and have her recall their names.